A 5-year study conducted in 20 countries reveals that four different fruit flies — which cause incalculable damage to crops across Asia, Africa, the Pacific and parts of South America — are, in fact, the same species. The discovery will not only ease trade restrictions, but aid global efforts to reduce the pest's population. Up until now, the Oriental fruit fly (Bactrocera dorsalis), the Philippine fruit fly (B. philippinensis), the Invasive fruit fly (B. invadens) and the Asian papaya fruit fly (B. papayae) have been nearly impossible to distinguish from each other, which has made them difficult to manage, quarantine and study. But the research project, sponsored by the United Nations, provided scientists with the time and resources that allowed them to examine the insects across a range of disciplines. 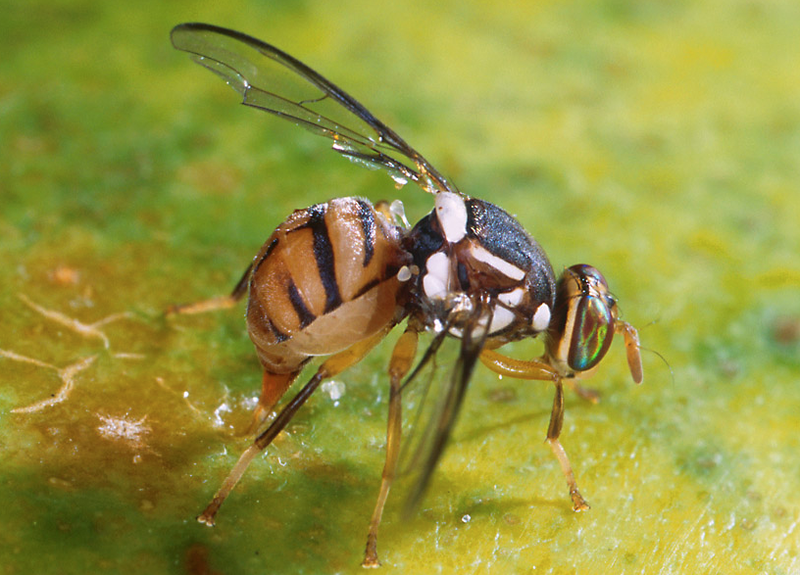 Using morphological, molecular, cytogenetic, behavioral and chemoecological data, they confirmed that the four species of fruit flies should now be combined under the single name: Bactrocera dorsalis, or the Oriental fruit fly. The ability to precisely identify species is central to pest management, including quarantine measures or bans applied to internationally traded fruit and vegetables. Preventing foreign fruit flies from entering their borders has been a major concern for several countries. The study's findings mean that trade restrictions linked to the fruit fly should now fall away in cases where the insect is present in both the importing and exporting country. "This outcome has major implications for global plant biosecurity, especially for developing countries in Africa and Asia," says the study's lead author, Mark Schutze, from the Queensland University of Technology. "For example, the Invasive — now Oriental — fruit fly has devastated African fruit production with crop losses exceeding 80% and has led to widespread trade restrictions with refusal of shipments of products into Asia, Europe and Japan, and significant economic and social impacts on farming communities." And now that scientists know the pests belong to the same species — and therefore breed together — they'll be able to reduce fruit fly populations through insect birth control strategies. One technique involves using low doses of radiation to sterilize mass-bred male flies, which are then released into infested areas. They'll mate with females, but not produce offspring. You can read the complete findings of the study, which have just been published in the journal Systematic Entomology.